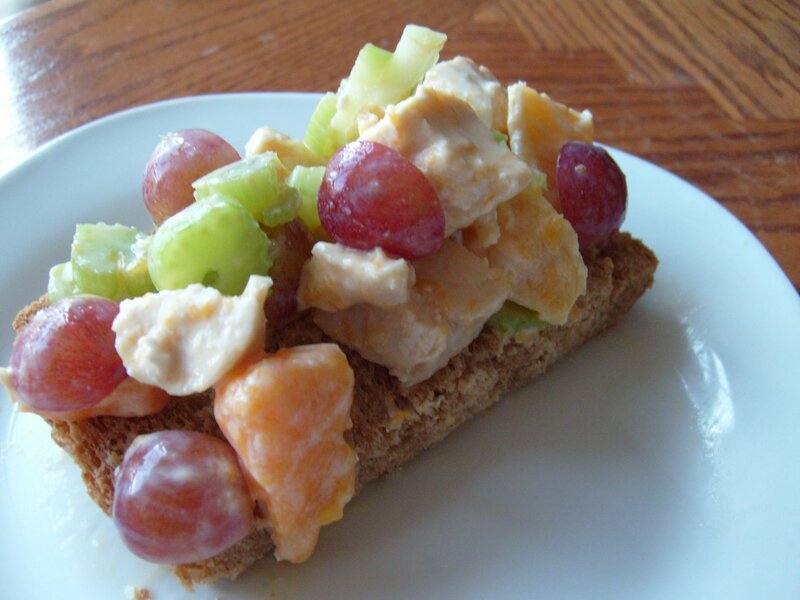 Fruited Chicken Salad – Nutrition.Health.Life. I have never been a fan of traditional chicken salad; something about the thick creamy dressing and obvious mayonnaise taste seemed to turn my off every time I tried it. Recently, Jason and I have experimented with less traditional types of salads. Here is a recipe for my most recent invention. We have also made a similar salad with turkey that I will post about in the future when we make it again. In a small bowl, mix the lemon juice and yogurt. In a large bowl, mix the remaining ingredients. Pour dressing on top and mix until everything is well coated. If desired, add more yogurt and/or lemon juice to taste. Serve with fresh greens, on toasted whole wheat bread, or by itself! *While in India last August (I can’t believe it has been a year already!) I had the BEST mango of my life; they were so juicy we could peel them with our hands. The flesh was a deep orange color, unlike the traditional yellow color you often find here. However, Jason and I, in an attempt to save money, have started going to Aldis for some of our grocery needs. There we got the BEST mango I have ever had in the US; the sticker was in Spanish, so I am assuming they were mangos from the local Spanish grocery store. Regardless, they were 100 times better than the mangos I bought at Jewel earlier this summer. Just a hint: when shopping for mango, try to find one that is soft and smells like mango; this means it is at perfect ripeness! Enjoy! This entry was posted in Nutrition and tagged chicken, fruit, side dish. Bookmark the permalink.